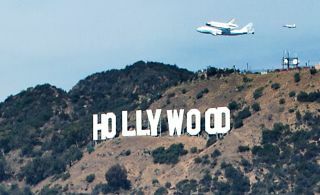 Photographer Olivia Hemaratanatorn captured this view of space shuttle Endeavour soaring over the famed Hollywood sign during its low flyover of Los Angeles on Sept. 21, 2012. Endeavour landed at Los Angeles International Airport and will ultimately be placed on display at the California Science Center. LOS ANGELES — The space shuttle Endeavour has touched down for the last time, but its travels aren't over just yet. Endeavour currently sits at Los Angeles International Airport, where it landed Friday (Sept. 21) atop a modified Boeing 747 jet after a three-day farewell tour that first took off from NASA's Kennedy Space Center in Florida. The shuttle will live out the rest of its days here in the City of Angels, but it's still 12 miles (19 kilometers) from its final destination, the California Science Center. And they will not be easy miles. To reach its museum retirement home, Endeavour will chug down surface streets through the heart of Los Angeles at 2 mph (3.2 kph) or less — a far cry from the space plane's 17,500 mph (28,160 kph) orbital speed. Spectators crowd the fence as the Shuttle Carrier Aircraft (SCA) carrying space shuttle Endeavour, taxis to the welcoming ceremony, Friday, Sept. 21, 2012, at Los Angeles International Airport. Museum officials have been planning out this trek since shortly after NASA awarded them Endeavour in April 2011. The science center could draw little guidance from history, for the shuttle's street parade will be unprecedented. "There's nothing that big that's been moved through the center of a city before," Marty Fabrick, who is managing Endeavour's move for the science center, told SPACE.com. "So there really was no playbook." The space shuttle Endeavour flies over the Golden Gate Bridge in San Francisco, CA, Friday, Sept. 21, 2012. The space shuttle is too wide (78 feet, or 24 meters) and too tall (58 feet, or 18 m) to cruise unobtrusively down LA's streets like your average SUV. So the museum has been working with city and utilities personnel to remove obstacles along Endeavour's path, Fabrick said. Some of these obstructions — such as street lights and power lines — will be put back shortly after the shuttle passes by. "It's a very choreographed operation," Fabrick said. "Literally, there will be hundreds if not thousands of people on the route doing all this work while we're moving Endeavour." After the shuttle arrives at the science center on Oct. 13, the museum will spend about two weeks touching up the orbiter and its exhibit. Endeavour, which flew 25 space missions between 1992 and 2011, is slated to go on display Oct. 30. But even that date won't mark the end of Endeavour's journey. The California Science Center is still working out details of the shuttle's permanent exhibit, which will showcase Endeavour in a vertical position as if ready to launch, flanked by the external tank and solid rocket boosters that helped get it off the ground. The final exhibit should be all ready to go within five years or so, said California Science Center president and CEO Jeffrey Rudolph. "It's going to be so awesome," Rudolph told SPACE.com. "I think that moment when you see the whole full stack — it's sort of jaw-dropping. People are just going to go, 'Wow!'"